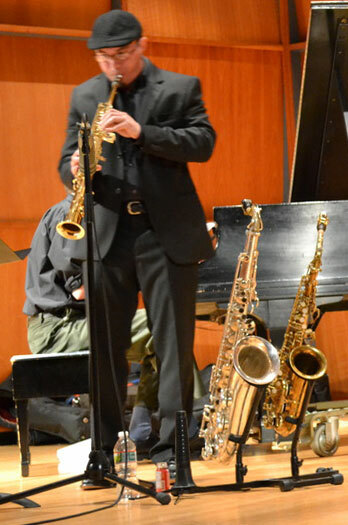 Brian McCarthy is a saxophonist, composer, and educator. He also says he is a Civil War geek. 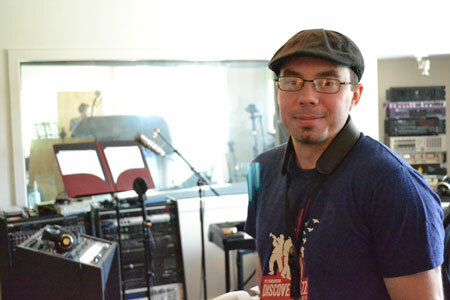 One more thing: Brian is the recipient of an FY2015 Creation Grant from the Arts Council—funding that provided him the opportunity to write a chamber jazz suite. 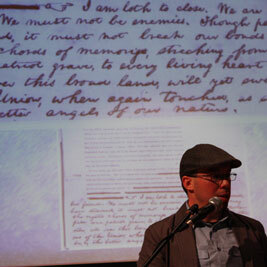 For inspiration, he dug into the written words of Abraham Lincoln’s first inaugural address; these words came as the Civil War was looming. Brian says he found the words of a lawyer, a president, and a human in that address. In the words he found most human, he discovered the title for the suite. Brian believes jazz is one of the better angels of our nature. Looking back to original sheet music via the Smithsonian, he has taken songs from the civil war era to compose for a jazz nonet. 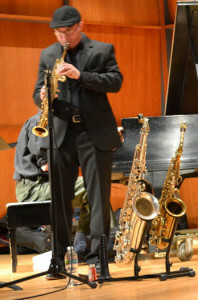 Brian knew from the beginning the players would include pianist Justin Kauflin. Comments in the interview about working with visually impaired musicians spring from Justin’s involvement. Q. When you proposed this project, you said, “Composing and presenting the changing sound of jazz arranging is important to the art form, and to showcasing the genre as relevant and inspiring to our Vermont community.” Then you added, “We have entered a new era of jazz being taught in Universities and most of the music being written. Say a little bit about the changes in the genre. How do you describe the new era and changing landscape of jazz? What is different? Where is jazz going? A. With fewer and fewer venues presenting jazz, album sales almost nonexistent, and more solid players than ever before, it’s a difficult environment for the jazz musician. Our challenge is to offer ways for the audience to take a chance on our art. I find with young audiences today, they don’t even know why they haven’t given the music a chance. If we offer honest and clear answers to “why jazz,” then the future audience will at least be at our gigs because they want to be there, not because someone told them they should be. Q. You also said, “The changing landscape has created stereotypes for visually impaired performers centered on the fact they cannot read music, and therefore cannot learn new works. I hope to break some of these misconceptions.” Does this evolution actually create any challenges for visually impaired artists, or is that entirely a misconception? A. Working with my friend and brother-in-musical-arms Justin Kauflin (who is a visually impaired pianist, and playing on this project), along with recently departed trumpet great Clark Terry, they’ve shown me through their experiences how strongly and responsibly I need to know my own music in order to run the best band possible. Jazz over the years has evolved into a more complex art form. So complex and acrobatic that it’s easy to lose sight of all the working parts. Because of this, there seems to be a misconception in regards to visually impaired musicians. Some composers/bandleaders have this fear of “how will they learn my new song in time for the gig tonight? !” There is a problem in my opinion, but it doesn’t lie with the visually impaired musician. No, the problem is with the musician that loses sight of their own music to the point that they don’t know how to convey the information effectively to anyone. Q. Creation Grants are not commissions, and have no restrictions. You knew that going into the project, and said, “As a result, this project will showcase my abilities as a writer, not just for hire, but as a professional aesthetic artist….this project will allow me to use my full unrestricted ability to explore the colors and textures of the jazz idiom. Where did this take you? How does your aesthetic artist shine in the music? Q. The work is almost ready for performance. What happened that you expected, and what happened that you didn’t expect? Q. You’ve built an entire career with your ability to create. Talk about that. A. Like Darwin’s Theory, my career continues to evolve. Each gig, each project, learn and grow from it. It’s a grind, filled with success and not-success. But if you find something to take away from the good and the bad, then there is no such thing as failure…just the occasional harsh lesson. You can hear the work either Friday or Saturday in the FlynnSpace. Dixie’s Land—Note from McCarthy: This is the most controversial song, being attached to minstrelsy, the lyrics are a bit shocking when you realize its connection to slavery and racism.